We’ve all run into CAPTCHAs, those annoying registration fields you never get right on the first try. But CAPTCHAs do play a valuable role, keeping spambots out by verifying that you’re a human. On top of this, reCAPTCHA serves a greater good, having you digitize old books in the process. CRAPCHA doesn’t serve a dual purpose. It barely serves a single purpose. And it isn’t to keep spammers out. If you run a site and want to spring this on your unsuspecting guests, simply copy and paste the following code. Word of warning, CRAPCHA doesn’t actually validate anything. On the other hand, it’s fun. CRAPCHAs are created using a mix of weird Unicode and Font Awesome characters that have undergone CSS3 transforms. Attempts are saved and retrieved using the lovely service provided by Parse Firebase. 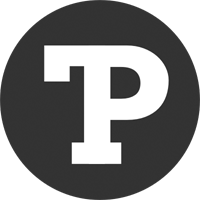 You can check out CRAPCHA’s source on Github. Sign me up!! Oh, wait, I can’t.. The anti-website-traffic!!! Cool!! Love it!! Great, thanks, part of my site. Best. Loving this. We got sick of recruitment agencies cold calling us and emailing us crap CVs so in a similar vein to crapcha we came up with http://www.rankarecruiter.co.uk/. We would like to find a way to integrate crapcha into the next iteration. Great work. Very subtle! I would not have suspected a thing until the dodging button starts laughing at you. 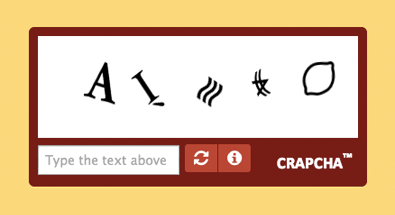 Nice, I had a similar idea about using CAPTCHAs as an advertising vector. Didn’t know it was already out there!